I was in New Orleans recently to speak at the DRI Toxic Torts and Environmental Law Seminar, and while I was in the city, I took some time to visit the National WW II Museum in the downtown area. 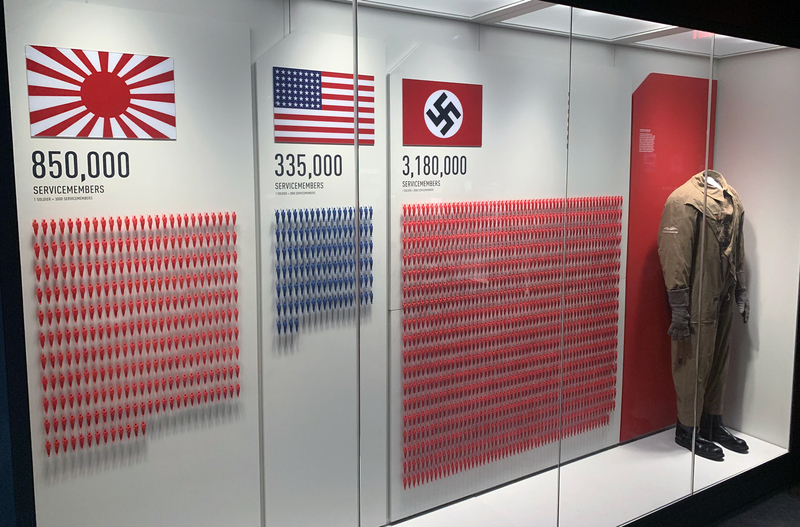 At the museum, I was struck by a graphic exhibit that showed that in 1941, the United States had only 336,000 soldiers in uniform, compared with 850,000 for Japan and 3.1 million for Nazi Germany. There is a quick and easy lesson here for trial lawyers. This exhibit told me, as it was intended to do, that the outcome of the war was far from a foregone conclusion. In view of the troop strengths at the start of U.S. involvement in World War II, it’s quite possible that another outcome would have come about. The exhibit also neatly pointed out a principle that I like to tell trial lawyers about. Basically, it’s one demonstrative exhibit, one message. Too often, especially when illustrating the testimony of expert witnesses, law firms come to A2L with sprawling graphics, full of footnotes and complications, that are difficult to decode and difficult to understand. Jurors have at most about 30 seconds to take a look at a graphic and try to make sense of it. They have no time and no interest in figuring out subtle nuances or in getting more than one message from an exhibit. This is not the moment to be complicated but the moment to be clear. Indeed, if you find yourself using a key, a legend, a double y-axis or having to spend more than a few seconds explaining a demonstrative exhibit, something is very wrong with your approach to your demonstrative exhibits. This idea of keeping it simple and on message applies not only to trial graphics but also to pretty much everything that a trial lawyer does. As effective storytellers, we need to develop themes that are believable, consistent, and above all simple and straightforward. That constituted the point and the effectiveness of this World War II exhibit. Without undue fuss, without footnotes, and with a basic graphical theme using human figures to represent soldiers, it told its story to its viewers. It was one of the first things you saw in the museum and thus it set the tone for what was to come. Trial lawyers need to do exactly the same thing with their messaging and their demonstrative exhibits. With So Few Trials, Where Do You Find Trial Experience Now? What Does A Case-Winning Trial Graphic Look Like? Free Guidebook: Why Should I Work with A2L Consulting? While attending the Delaware Law School in the early 1990s, Ken taught himself computer animation as a hobby. It was that hobby, combined with his law degree and a degree in economics from the University of Mary Washington that helped launch his career of entrepreneurship. In 1995, he founded his first company, A2L Consulting, where he serves as its President/CEO. A2L provides trial support services to all of the nation’s top law firms and their clients around the world. Often called upon when the dollars at stake are high, A2L’s services include helping to predict how judges and juries will react to a case, the creation of sophisticated visual evidence used to persuade judges and juries, and the deployment and use of state-of-the-art technology in the courtroom. Bestselling business author Dan Pink highlighted A2L in his book, A Whole New Mind: Why Right-Brainers Will Rule the Future, and Ken has been quoted by many news outlets including the Wall Street Journal, Inc., NBC News, Wired, the Washington Post, and the BBC. Recently, the readers of LegalTimes voted A2L "best jury consultants" and "best trial consultants," and readers of the National Law Journal voted A2L "Best Demonstrative Evidence provider" in the country. Many other publications have held similar votes and ranked A2L at the top of a key category. The American Bar Association named A2L’s blog, where Ken and his colleagues publish weekly, one of the top 100 blogs in the legal industry and one of the top 10 litigation blogs. In 2013, Virginia’s Governor appointed Ken to a four-year term on the University of Mary Washington’s Board of Visitors. He has also served on the Dean’s National Advisory Board of Delaware Law School and a variety of local and business boards and advisory groups. A2L Consulting has extensive experience in complex litigation. For more than twenty years, we have worked with all top law firms on more than 10,000 matters with at least $2 trillion cumulatively at stake. A2L is regularly voted best jury consultants, best trial consultants, and best litigation graphics consultants. © A2L Consulting 1995-2019, All Rights Reserved.